Double Studio Apt in Wembley only 15 Minutes from Central London. Newly refurbished suitable for 2 person. Communal Garden. Bed Linens & Towels, Iron & hair drier. High Speed Wifi. New fully Equipped Kitchen. Amazing location. Wembley Stadium, Wembley Arena, London Designer Outlet, Wembley Stadium station minutes walk. Supermarket 3 minute walk. London Designer Outlet 4 minute walk with shops, Cinema & restaurants & bars. Free Netflix! Ideal for solo adventurers, Couples or Business travellers. A Brand New Double Studio in Wembley sleeping 2 persons. Access to communal Garden. Fully Equipped Kitchen & Bathroom both Inside apartment for private use. Only 11 Minutes away from Central London Via Wembley Stadium Station. 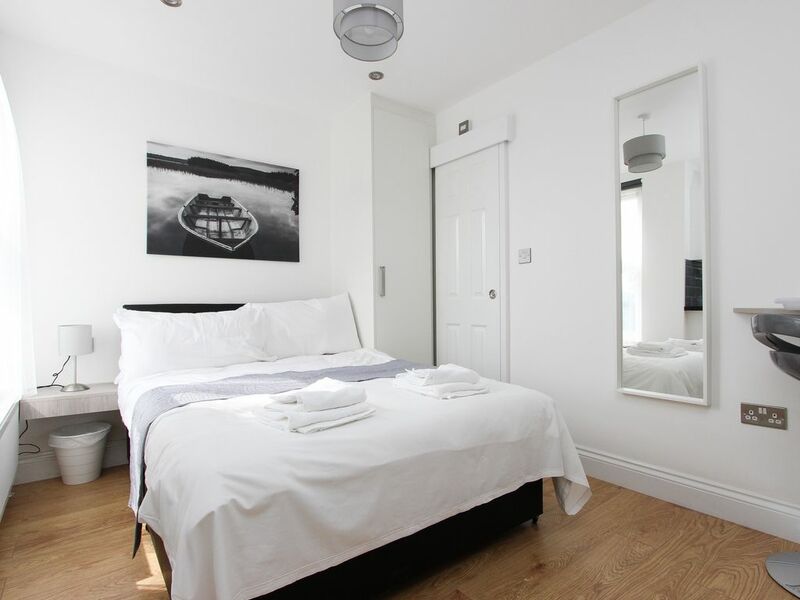 The Studio has just been refurbished to a high standard and comes equipped with a Double bed for 2, LCD TV, Wardrobe & Hangers, Free high Speed WIFI and a Desk & Chairs. Fresh Bed Linens and Towels are provided to guests upon check in as well as an in-room iron, iron board, clothes hanger and hair drier. Free Netflix provided! The Private En-Suite Shower Room Consists of a Toilet, Sink and Shower enclosure. The kitchen comes equipped with Under counter fridge/Freezer and needed to cook light meals with hob & microwave oven. There is a Communal Washing machine provided in a different area of the house. The Location is amazing with local amenities such as Wembley Stadium, Wembley Arena, London Designer Outlet and Wembley Stadium station all within a few minutes’ walk. A Tesco Supermarket is only 4 minutes’ walk away for all your grocery needs. London Designer Outlet is only a 4 minute walk away and consists of 53 designer shops as well as a cinema and 22 different restaurants and bars. Quick Access to Central London and a huge selection of local amenities. Perfect for solo adventurers, Couples or Business travellers. Guests Have private access to the Whole Studio Apartment. Access to Communal Washing Machine. I dont live here but am always available when needed. Please note when walking to the property from the station there is a slight incline so the property is only advised to those who are fully mobile on their feet. The Studio Apartment Is Located in the Heart of Wembley. Quick Access to Central London and a huge selection of local amenities. London Marylebone Zone 1 is only 11 minutes away by Train. Local amenities such as Wembley Stadium, Wembley Arena, London Designer Outlet and Wembley Stadium station all within a few minutes’ walk. A Tesco Supermarket is only 3 minutes’ walk away for all your grocery needs. London Designer Outlet is only a 3 minute walk away and consists of 53 designer shops as well as a cinema and 22 different restaurants and bars. Other local Bars, Shops & Restaurants are all within walking distance. Wembley Stadium station is the closest and is a 6 minute walk away. Trains can reach London Marylebone in 11 minutes with 1 train leaving approximately every 20 minutes. From London Marylebone You can also go Direct to Birmingham in under 2 hours. Wembley Central station which is a 8 Minute walk away and is on the bakerloo line which can bring you into Central London in 15 minutes also. Wembley Park Station which is a 12 Minute walk away and is on the Metropolitan & Jubilee lines which can bring you into Central London in 12 minutes also. El apartamento en general está bien, en buenas condiciones. El problema es la ubicación, está un poco alejado y según la descripción pensábamos que estaba más cerca del transporte. Los detectores de humo que tienen dentro suelen hacer unos pitidos bastante fuertes durante todo el día de manera intermitente, por lo que es molesto. Por lo demás todo bien, las instrucciones para conseguir la llave eran claras y sin ningún problema accedimos al apartamento.